added to the spooky The Shining atmosphere! 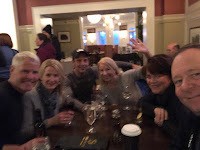 A few weekends ago, my husband and I traveled to North Conway, NH, for a fun-filled skiing weekend with friends. Now, I only cross-country ski at this point in my life, thanks to a certain disastrous skiing weekend in 2013. But, that's okay, because I was able to cross country right from the back door of our friends' condo, while most of the others drove to a nearby mountain. But as we all shared coffee and chatted that first morning, the subject of having drinks later at Mount Washington came up. 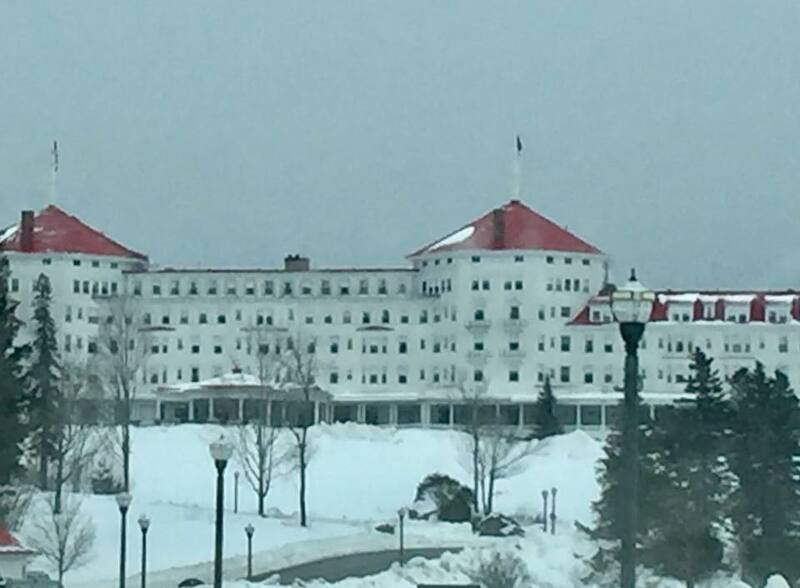 I had no idea what everyone was referring to, but by the time I'd learned this grand hotel was built from 1900 to 1902, had an amazing view of the highest mountain in the Northeastern U.S., boasted a fascinating--some say haunting-- history, and eerily resembled the hotel in The Shining, I knew I had to get myself there, and not just for drinks. 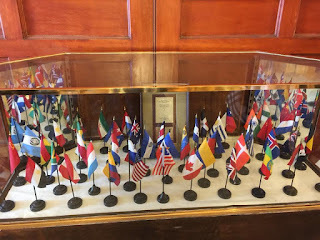 I called to inquire about the daily tour schedule, and three of us made the short trip to Bretton Woods early to learn more about Mount Washington. **Disclaimer...I took photos and notes from the tour and backed it up with research, but any mistakes are mine. 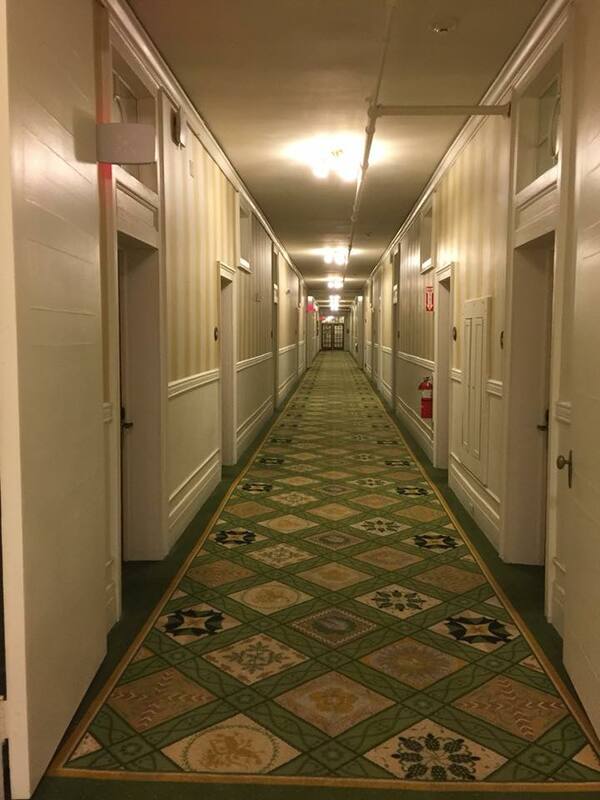 First impression is that the hotel does indeed look like the Overlook Hotel from Stephen King's The Shining, both outside and in some parts of the interior. And due to efforts to return the decor to the vintage splendor of the opening season in 1902, walking through the doors feels like stepping back into the past. As our guide began the tour, we learned that this hotel was indeed the height of luxury even when it opened...it was one of the first hotels to have electric lights and private bathrooms. In fact, Thomas Edison himself designed the lights that still grace the lobby. original balcony that was part of her rooms. The original owner and builder, Joseph Stickney, saw only one season before he passed away, leaving his young bride Carolyn to inherit the property. Carolyn eventually remarried a prince and was hence known as "The Princess". During her years of presiding over the hotel, she became known for some eccentric habits...for example, she would sit in a balcony of her room, overlooking the staircase leading to the dining room, to watch the guests descend for dinner. If any of the ladies were dressed more elegantly than she was, she would change. 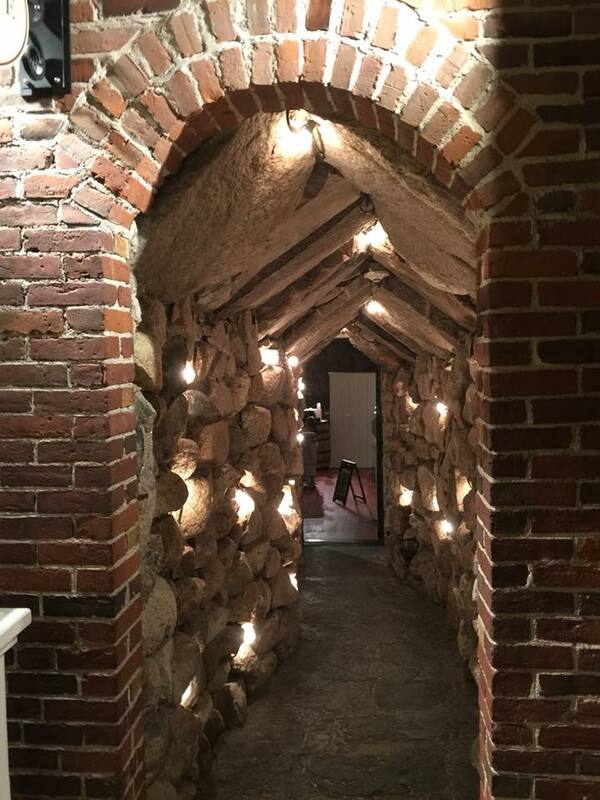 If she dined in the dining room, she was the last to enter, and she ate alone at a small table by the door, which was closed after her entrance. No one was permitted to leave until she did. Apparently, she also was quite attached to her large four poster bed...which I understand completely. But she went a step above and beyond and took it with her wherever she went...having it disassembled and then reassembled during her travels. 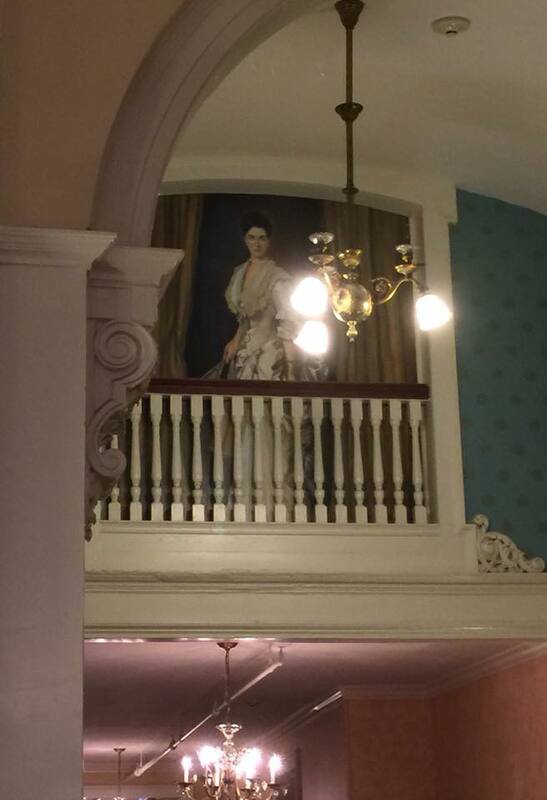 She died in the bed, and it now welcomes guests who opt to stay in "The Princess Suite" (Room 314)...the haunted room, or at least one of them, according to gossip. Where can I sign up? 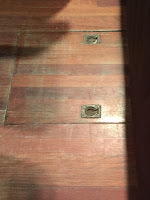 Prohibition in the 1920s put a damper on the hospitality industry, but on the tour, we were introduced to an area, now The Cellar bar, where a plan existed to circumvent the national law. Guests drank liquor out of teacups, and a lookout sent up an alarm in the event of an impending raid. 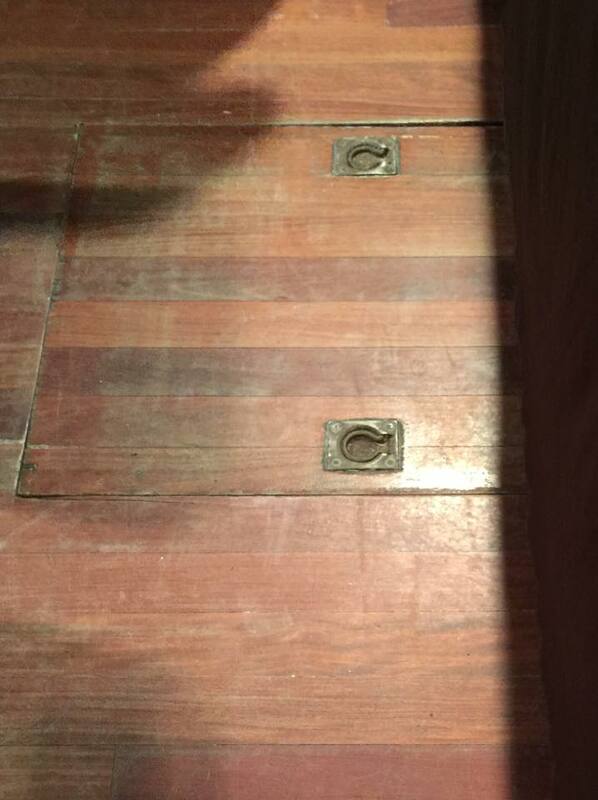 The liquor was dumped and the bottles were tossed into a barrel, which was lowered into this trapdoor in the floor. After The Princess passed, her nephew inherited the hotel, but he wasn't particularly dedicated to managing a resort, and financial struggles and WWII resulted in closure in 1942. Shuttered, the abandoned property stood vacant until 1944, when it was purchased and renovated in preparation to serve as the site for the Bretton Woods monetary conference. During the clean-up, workers were instructed to paint everything white...which resulted in gilded artwork and trim, stained glass windows, and original brass lighting being coated in white paint...the great "White-out". Much of this has been restored, except the gold leaf paint, which is now lost forever. Thankfully, one room was left alone, the gold paint intact, for reasons unknown. 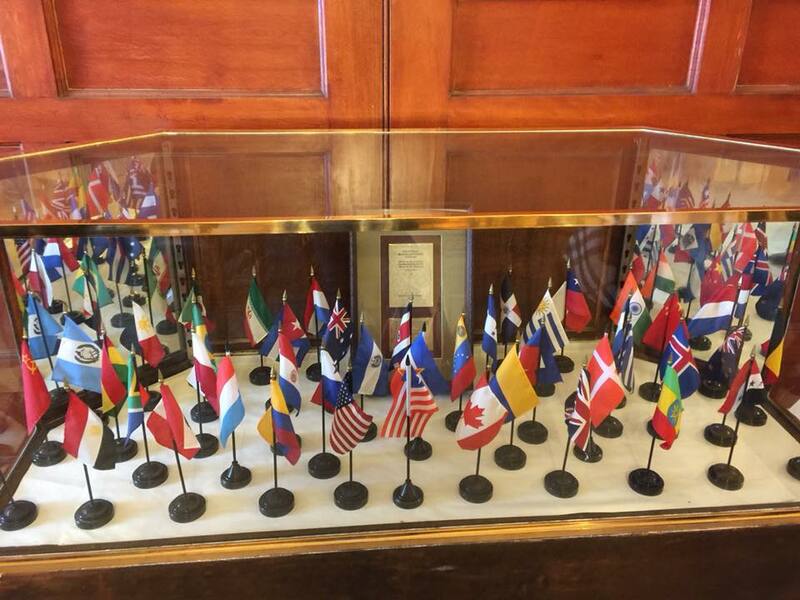 The Bretton Woods conference hosted 730 delegates from all 44 Allied countries while the world was still at war. Part of the reason Mt. Washington was chosen as the site involved security...with so many leaders of different countries in one location and WWII raging, security was a major concern, and the hotel surrounded by mountains had limited access. The conference resulted in the establishment of the World Bank and the International Monetary Fund. Now the hotel has been restored to its original glory as closely as possible, and it is owned by Omni. It's on the US National Register of Historic Places and is a US National Historic Landmark. skiing at the hotel pub for a fun night! Closer to my passion for spooky things, the hotel has been featured in two episodes of Ghost Hunters...so, yeah...I hope one day I can actually stay overnight. But even just a day trip for the tour, the breathtaking view, and a fun time in the pub made for a memorable weekend! 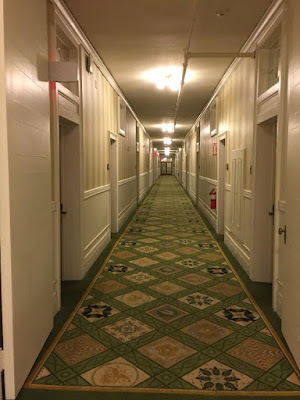 If you enjoyed this post, check out some of my other posts on my visits to haunted historical places: The Catacombs of Paris, The Dakota Hotel in NYC, The Old Jailhouse in Barnstable, and The Abandoned Glenn Dale TB Hospital...to name a few! And I hope you'll check out my novels in the tabs above if you enjoy spooky suspense!